Washington Monthly | E-Counseling 2.0: Can a New Wave of Virtual Guidance Help? Last December, when Amal Abdi found out she’d gotten into Yale early with a full scholarship, the first thing she did was call her parents, who had fled war-torn Somalia in the 1990s to start a new life in Columbus, Ohio. The next thing she did was text Chloe Collins, a young woman in Minnesota whom she’d never met—but who had been her guidance counselor, confidante and occasional nudge, throughout the college application process. Collins, however, had no trouble believing it. Abdi was at the top of her class, and Collins had worked with about 200 students like her in a new virtual advising program by College Possible, a nonprofit founded in 2000. College Possible is one of many college advocacy groups hoping that technology will jumpstart the slow growth of low-income students in higher education. The last couple years have brought a renaissance in virtual guidance counseling—both new services and existing ones upping their game with mobile, social media and data analytics. It’s e-counseling 2.0. The American School Counselor Association recommends no more than 250 students per guidance counselor, but the nationwide average is nearly twice that. For years, College Possible has tried to bridge the counseling gap for low-income students with two-hours of after-school college prep, held twice a week at partner schools and led by recent college graduates from AmeriCorps. They’ve had success, but doing everything on-site limited their reach. 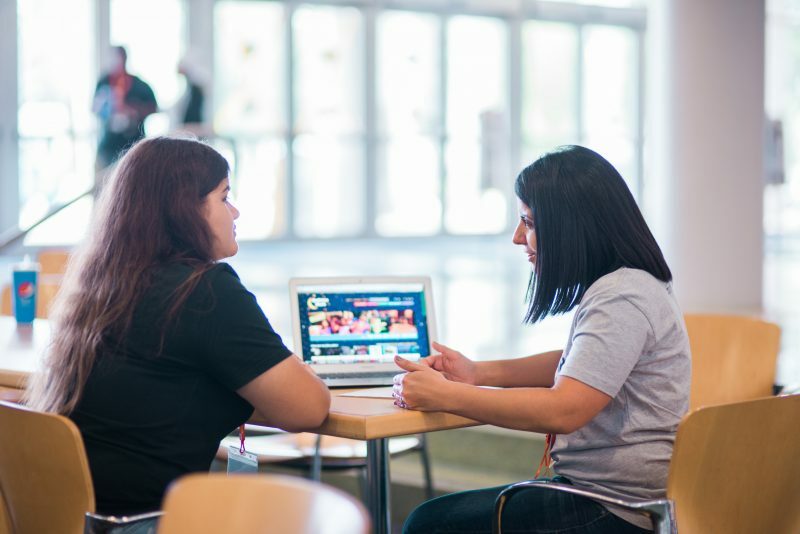 So, in 2014, they launched CollegePoint, a virtual version of the after-school workshop—emailing students timely information and tips about everything from financial aid to homesickness in their freshman year, followed by a phone call or a web chat with a trained counselor at least once a month and more frequently if the student needed it. Besides editing Abdi’s essays and helping her navigate financial aid applications, Collins was a ready source of moral support. Early on, when Abdi assembled her “balance list” of potential colleges, the low acceptance rates and sky-high average SATs of the most selective colleges left her feeling inadequate and intimidated. Studies of college advising and mentoring programs have shown them to be effective in getting low-income kids to and through college. Despite a proliferation of such efforts in recent years, however, their scope remains dwarfed by the need. Between 1970 and 2013, the percentage of Americans in the lowest income quartile with a college degree by age 24 rose from 6 to 9 percent, according to the 2015 Indicators report by the Pell Institute for the Study of Opportunity in Higher Education. So, to expand their influence, College Summit has made a decisive turn to the virtual in the past couple years. They digitized the lessons in the textbooks they used to publish offering tips on writing essays, finding scholarships and identifying quality colleges that matched student interests. They ditched the old model of holding grade-specific College Summit classes in schools and launched the PeerForward program, in which teams of high school juniors and seniors, trained over the summer and assisted by a faculty advisor and “remote coaching” Web chats by a College Summit staff member, plan their own activities and workshops to foster a “college-going culture” in their school. 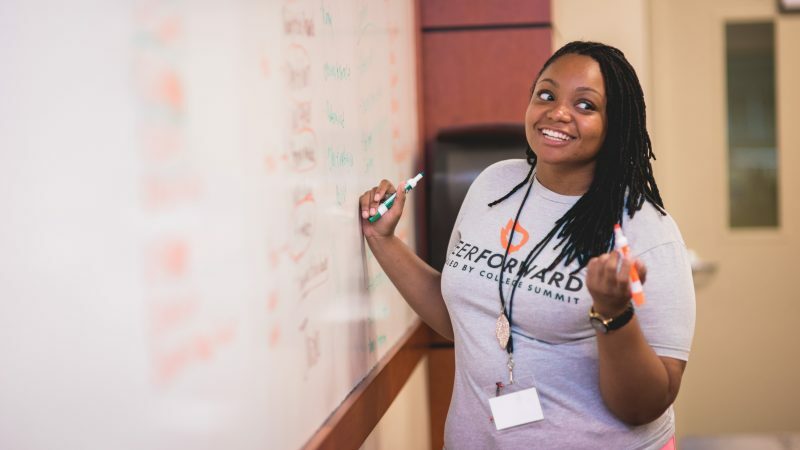 For example, PeerForward students have organized all-school assemblies where they read the personal essays they worked on at College Summit’s summer training and teach their classmates how to craft their own. They have set up FAFSA (Free Application for Federal Student Aid) booths at school open houses. And they’ve led teachers and counselors in “appathons” where they demonstrate a dozen or so free college-guidance apps that College Summit curates on its new LinkForward website. Meanwhile, more-established virtual advising programs have been busy revamping their approach. For instance, since 1999, iMentor has matched low-income high school students with professionals in a variety of fields for multi-year mentoring that blends virtual and in-person interactions, increasingly focused on college success. The virtual piece was just email exchanges, until last year when iMentor launched a mobile-device-ready, multimedia platform that incorporates document sharing for writing feedback, as well as videos to prompt real-time conversations and advising. Last year, another virtual mentoring outfit, iCouldBe, founded in 2000, partnered with DataKind, a nonprofit that crunches data for philanthropic and social-justice groups, to track the interactions on their own online platform and improve students’ engagement with their post-college role models. For example, the data showed that girls completed more of the activities and used many more words in their written responses to conversation prompts than the boys did, according to Kate Schrauth, executive director of iCouldBe. Between 1970 and 2013, the percentage of Americans in the lowest income quartile who had a college degree by age 24 rose from 6 to 9 percent. Still, the biggest challenge for any virtual mentor or guidance counselor is replicating the sort of trusting relationships that builds more naturally when meeting face to face. To that end, in 2016, CollegePoint added a summer texting initiative for advisees between junior and senior year. Abdi, for one, says she knew she could count on Collins, who spent a lot of time helping her revise her essay in Google Docs. 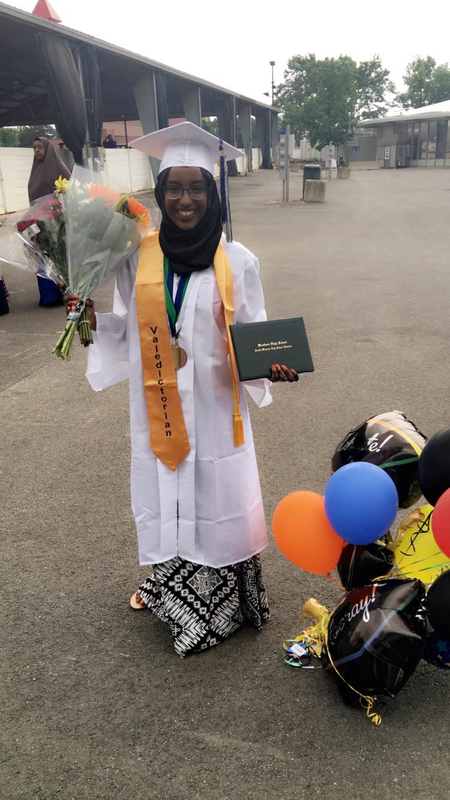 “She stressed that I should focus less on my test scores and more about who I am as a person and what’s my motivation for going to school,” said Abdi, who wrote her essay about the expectations she felt, as the eldest child of immigrants who had left everything behind to give her the opportunities she now enjoyed. Neither of her parents had gone to college. Her dad worked as a taxi driver and her mom was a package handler for FedEx. They depended on their daughter to help fill out official forms, decipher bills and translate parent-teacher conferences. Of course, just because Abdi’s parents couldn’t help much with her college applications didn’t mean they didn’t have big dreams for her. When Abdi called them about Yale, they said, “Congratulations! Now, apply to Harvard.” She did and was accepted. She will be heading to Cambridge, Mass., this fall and plans to major in engineering. Chris Berdik is a science journalist who has written about a wide variety of topics, including the intersection of science with ethical issues and the peculiarities of the human brain. (“Why Our Brains Make Us Laugh,” for the Boston Globe, for example.) His book, Mind Over Mind: The Surprising Power of Expectations, was published by Current, an imprint of Penguin, in 2012. A Harvard graduate with a master’s degree in journalism from Stanford University, Mr. Berdik has been a staff editor at The Atlantic and Mother Jones. His freelance articles have appeared in the New York Times, the Washington Post, the Boston Globe and Boston Magazine, among others, and his radio and multimedia stories have appeared on Smithsonian.com, WBUR (Boston’s NPR station) and Sciencestage.com, among others.